If thereâ€™s one ship every naval wargamer knows, itâ€™s the German battleship Bismarck. Forty thousand tons of menace, unleashed into the North Atlantic in the spring of 1941 to wreak havoc on Allied shipping. The British Home Fleet tried to stop her, but Bismarckâ€™s guns ripped apart the battle cruiser Hood. The pride of the Royal Navy went to the bottom of the Denmark Strait southwest of Iceland and Bismarck disappeared into the fog. But HMS Prince of Wales had managed to hit Bismarck below the water line, and she left behind her a slick of fuel oil. The British Home Fleet relentlessly tracked the German warship, and she finally sank beneath a hail of gunfire. 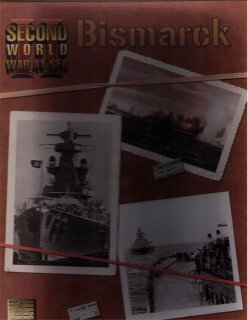 Bismarck: Commerce Raiding in the North Atlantic is the latest installment in the Second World War at Sea series, and the one wargamers have demanded since the series debuted. The game covers the famous hunt for the Bismarck, but also all of the other German commerce raids into the Atlantic between the fall of 1939 and the summer of 1941. The breakout of the battle cruisers Scharnhorst and Gneisenau is here, the raids of the cruisers Admiral Hipper and Scheer, and much more. Like all games in the series, this one is packed with scenarios. The German player is trying to sneak past the British picket lines, and then seek out and destroy the vital convoys that bring troops, food and supplies from the rest of the world to Britain. The British player has vastly superior forces, but the Atlantic is a huge place. Thereâ€™s plenty of open ocean in which a German raider can hide. When more than one of them is loose, the task facing the Royal Navy is even more daunting. The Germans receive all the raiders that entered the North Atlantic, famous ships like Prinz Eugen, but also some that could have but did not, like the battleship Tirpitz and the aircraft carrier Graf Zeppelin. The Royal Navy contingent is very large, and thereâ€™s also a large part of the United States Navy involved. Though the Americans did not fight the Germans, on more than one occasion American task forces joined the hunt for German raiders with orders to engage them if located, even though the two nations were not yet at war. There are several French ships involved, and the proud Polish destroyer Piorun as well. If the Germans are operating close to land, they do have formidable air support available, though this appears in a semi-random fashion similar to Bomb Alley. But the real prizes are found far from land, where the ships are on their own. Submarines play a much larger part in this game than in previous titles in the series as well. The game has one of the larger operational maps in the series; the North Atlantic is a big and empty place. There are two 34x22-inch maps, covering the area from north of Iceland south to the latitude of Spain. The tactical map is a generic blue field of hexagons, used to resolve surface combat. There, ships maneuver and fight using their gunnery and torpedo factors. Each player rolls a number of dice according to the shipâ€™s capabilities, hitting on a result of 6. Gunnery and torpedo damage tables give the results: ships can suffer damage to engines, hull or armament. Air attacks are resolved in similar fashion. The combat systems yield results rapidly but in a historically accurate fashion, giving a good balance of fun and insight.